Do you want a power unit with or without backhauling? Do you want a security camera? What is your power drawin Watts? Sun-In-One™ has the solution for remote solar security camera power units needs including industrial, commercial, law enforcement and government video security applications. These power kits and back up power units provide remote power to your video surveillance system 24/7. So, power issues are not a problem for your real time high resolution video system anymore. We also have kits that provide the power unit, or video back hauling up to 20 miles line-of-sight, and even the camera if needed. This exclusive surveillance power kit features a high resolution 6mp line camera with a digital zoom lens, water proof wireless transmitter, solar panels that provide power for 24/7 for 4 days plus and enclosed battery housing that also allows you to mount your camera on it or on the pole and if needed we provide poles from 10 to 30 feet. We have Solar powered kits for both AC and DC systems. The kits are designed to meet most of the needs of a security professional with a solar power kit kit from 10 to 60 watts DC and 10 to 50 AC A/C. We also design custom kits for any need. The kits are configured based on the wattage needed for the solar power unit and come with just the the power unit, power unit, with back hauling, power unit, back hauling and a camera. 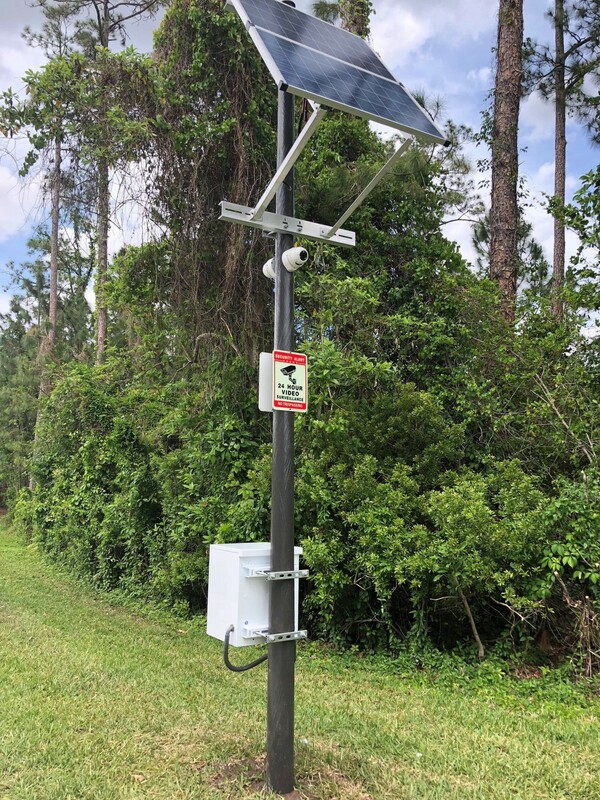 The Solar Surveillance Power Kit features a solid engineering to provide your security cameras or ours, power at any location where power currently is not located. Our high-resolution camera digital zoom lens, also include a free video management software system with on screen display and day/night digital signal processor. wireless transmitter is designed around three options short range and a few cameras, cellular modem ranges up to one mile away. Also includes digital memory up to 128 gigabytes, solar panel, enclosed battery housing, controller, optional poles and racking. To choose the best solar security camera power kit for your best needs, use the table below. Each kit number has been designed to work in the specified configuration at the specified wattage for 3 days, 8 hours a day solely on battery power. This ensures network stability and reliability. Find the product number that works best for you, or contact us and we will help you choose the kit best suited for your needs.